We are a few days adrift with this reference, but we've had a few days where there were multiple anniversaries, so we're just catching up with one or two we missed. Isidore Harburg was born on April 8th 1896 on New York's Lower East Side, the youngest of ten children of Russian Jewish immigrants, he adopted the name Edgar, and was also known as Yipsel, which is how the acronym for the Young People's Socialist League, of which we was a member, was pronounced. He met George and Ira Gershwin at high school and they became life-long friends, going on to attend New York's City University together. As a committed socialist, he was firmly opposed to the Great War so went to Uruguay for three years to avoid any involvement, and on his return got involved in business, as well as writing poetry for local newspapers. The crash of 1929 left him hugely in debt, and the Gershwins agreed to help him make some money as a lyricist. They introduced him to Jay Gorney, and he wrote the lyrics for some successful Broadway revues, including "Brother Can You Spare A Dime" for the revue "Americana" in 1932. The song became the anthem of the Great Depression. As a result Gorney and Harburg got a contract with Paramount in Hollywood, where Harburg worked with the likes of Jerome Kern, Jule Styne, Burton Layne and Harold Arlen. 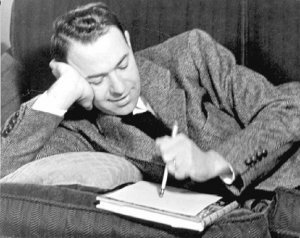 It was, of course, with Arlen that he wrote "Over The Rainbow" - in fact, Harburg was the final script editor for the whole movie. The song won an Academy Award in 1940 for Best Original Song. Not surprisingly, his left-wing views made him a target for McCarthy's Hollywood blacklist of possible Communist sympathisers, but he continued to write for Broadway, his most famous show being 1947's "Finian's Rainbow". Other songs for which he is remembered include "It's Only A Paper Moon", "April In Paris", "How Are Things In Glocca Morra" and "Old Devil Moon". Harburg's work, not surprisingly, is represented on a number of Acrobat releases - click on any of this selection of the artists - Frank Sinatra, Judy Garland, Lena Horne, Nat King Cole, Ella Fitzgerald, Glenn Miller, Raymond Scott, Gary Wilmot.